How do you make an outcast penguin determined to shine more loveable? Make him tap-dance. When young emperor penguin, Mumble, discovers he can’t sing like the rest of his class, he getsoutcast from his community and blamed for issues with lack of food. He must embark on a journey to prove the community elders wrong and deliver fish for the rest of the colony, while sticking to what he knows best: tap dancing. The overriding feeling from the film’s marketing campaign is that Mumble is a small, fluffy cute penguin, offering a perfect opportunity to sell kids merchandise and an adorable film. However, this isn’t the case, as only during the opening few scenes is Mumble a baby penguin. 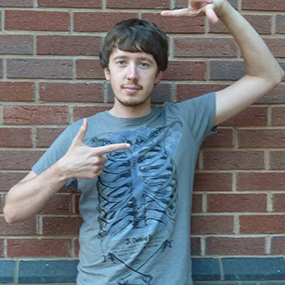 Luckily the film recognises that character progression needs to do just that, and moves forward in time, allowing a back-story from Mumble’s childhood to be developed while also building on the important characters and how Mumble became an outcast in his younger life. This acts as the fuel for the rest of the film and offers enough sympathy towards Mumble to make the viewer back him throughout. Despite the good work done on building Mumble as a lead, some of the side characters leave little to be desired. One of the film’s pivotal characters, Lovelace, is seen early on as a powerful and strong prophet, only when he’s revisited, when characters need his help, does the strong character appear as a weak and wounded support. Unfortunately, the film relies heavily on character interaction and therefore it’s these instances that leave the story wanting. A new element that Happy Feet introduces is non-animated actors, which is a little strange to see after watching an hour of animation before their introduction. Referenced throughout by the penguins as ‘aliens’, it’s quite an interesting change that the ‘alien race’ are real human actors, rather than the animated characters seen in most other films. 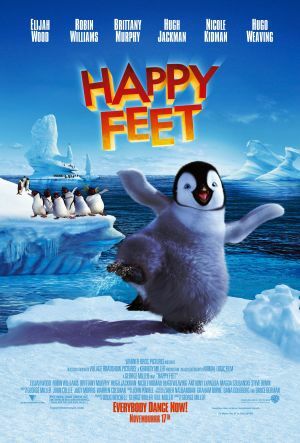 With this Happy Feet is able to visit new territory as a kid’s film combined with the eerie zoo that Mumble finds himself in at one point; especially when compared to more predictable story-lines from the bigger animated films, such as Ice Age and Finding Nemo. Kid’s films can sometimes be susceptible to maintaining small-scale animation, but this is certainly not the case here. Much of the film is visually beautiful, with far stretched glaciers and faultless snow that is best seen when they joyfully slide down the ice while being chased by an avalanche. As well as this great C.G.I., the film is also host to some interesting elements, like the Hitchhikers Guide to the Galaxy-esque zoom out from the Earth. These all add to the flavour of the film and make it a very visually appealing animation. For all its good looking, smooth C.G.I. and the different take on an everyday animated film, Happy Feet unfortunately fails to capture viewers attention fully. Despite the Oscar it won for Best Animated Feature Film of 2007, there are more interesting animated winter films available, specifically the afore mentioned, Ice Age.